The Western Region of the Eastern Cape stretches from the Tsitsikamma National Park to Algoa Bay and in the North to the Karoo as far as Middleberg. The main city of the area is Port Elizabeth, capital of the Eastern Cape and often referred to as the Friendly City. Port Elizabeth is the largest coastal city between Durban and Cape Town and is the third largest port in South Africa. The city was the landing place of the 1820 settlers and there are many examples of fine Victorian architecture to be seen there. The city sits on what has become known as the Sunshine Coast, and is renowned for its long unbroken sandy beaches. Beach entertainment is second to none, and the city is a mecca for old and young alike. At the extreme western end of the Western Region of the Eastern Cape along the coast lies the Tsitsikaama National Park. This park is in fact two parks, the Coastal Park and the Forest Park, both of which abound with natural beauty. The coastal park starts a few kilometers to the East of Plettenberg Bay and runs eastwards for some 75 kilometres to the mouth of the Groot River. It is bounded in the North by the cliffs and beaches and extending some 800 metres into the sea. There are several hiking trails along the coast and a unique Tsitsikaama Underwater Trail where the marine life is unbelievable. The Forest Park is a relatively small park of natural indigenous forest and can be found where the Storms River crosses beneath the N2 national road. This park is home to the Outeniqua Yellowwood, some of which exceed 50 metres in height. There are also many examples of stinkwood, ironwood and several species of tree fern. Just to the North of Port Elizabeth is the Addo Elephant Park. Back in 1919 a Major Pretorius was employed to eliminate all elephants in this area and described the area as "a bit of all that is bad in central Africa that had been picked up and dropped in the Eastern Cape". The surviving elephants from this slaughter, about eleven beasts, fled to the impenetrable Harvey Bush. There are now more than one hundred elephants roaming this 8590 hectare park. The coast of the Western Region of the Eastern Cape is dotted with friendly, warm holiday resorts. There is Jeffreys Bay and Paradise Beach, Kenton on Sea and Colchester, Sea Vista and the Storms River Mouth. All are hospitable small resorts offering miles of unspoilt beaches and some of the best surfing in the world. But inland there are some of the most interesting small towns. Graaf-Reinet is the oldest town of the Eastern Cape being established in 1786 and making it the fourth oldest town in the whole of South Africa. Graaf-Reinet is known as the Gem of the Karoo and is situated at the foot of the Sneeuberg Mountains surrounded by the Karoo Nature Reserve. 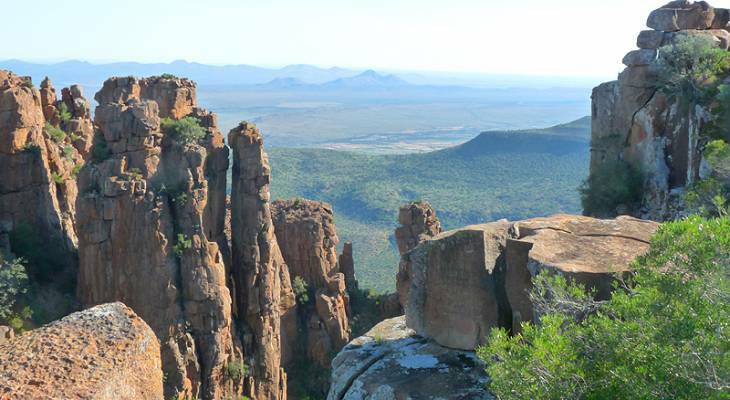 Just a few kilometers from the town is the Valley of Desolation, a deep, steep sided canyon that cuts through the Sneeuberg mountains to reveal the distant plains of the Karoo and its distant koppies. Further South and just to the North of Port Elizabeth lies the fifth oldest town in South Africa and second oldest of the Eastern Cape. Uitenhage has a long and colourful history and is often referred to as the Garden Town on account of its beautiful parks and gardens. The town is the centre of vehicle manufacturing for the Western Region of the Eastern Cape. The Old Station Museum was built in 1875 and was one of the oldest stations in South Africa. It was turned into a museum when a more modern station was built in another part of the town. The museum houses two vintage locomotives and several old coaches, and is well worth a visit. Western Region Accommodation and Information. Western Region, Eastern Cape.